All documents presented for filing with the Clerk's Office must comply with the Federal Rules of Appellate Procedure, the Local Rules of the Ninth Circuit Court of Appeals, and the Local Rules of this Court. A Notice of Appeal (form A-02) filed by counsel must be electronically filed and must include a representation statement pursuant to Ninth Circuit Rule 3-2. 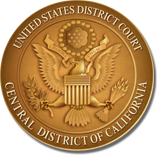 The fee to file an appeal to the Ninth Circuit Court of Appeals is $505.00 for civil and criminal cases. If you electronically file a Notice of Appeal, you may pay online with a credit card at the time of filing. Major credit cards (MasterCard/Visa, Discover, American Express) are accepted. You may also provide payment in the form of a cashier's check, certified bank check, business or corporate check, or money order drawn on a major American bank or the United States Postal Service, and made payable to Clerk, U.S. District Court. No personal checks or checks drawn on non-business accounts will be accepted from either an attorney or a member of the public. Transcript designations filed by counsel must be electronically filed, using Form G-126, Transcript Designation Form. For information on how to designate transcripts for the record on appeal, please refer to Ninth Circuit Rule 10-3. For instructions on how to order transcripts, see Court Reporter/Recorder Transcripts. A copy of the judgment or order being appealed and the proof of service must be attached to the Notice of Appeal. Pursuant to Local Civil Rule 11-4.1.2, the appeal package must include the original and one copy, both blue-backed. You may provide an additional copy to be conformed. When mailing the Notice of Appeal, submit the original and two copies of the Notice of Appeal and a self-addressed, stamped envelope for the return of the conformed copy. The filing fee for an appeal to the Ninth Circuit Court of Appeals is $505.00 for civil and criminal cases. No personal checks or checks drawn on non-business accounts will be accepted from either an attorney or a member of the public. Payment may be in the form of a cashier's check, certified bank check, business or corporate check, or money order drawn on a major American bank or the United States Postal Service, and made payable to Clerk, U.S. District Court. Major credit cards (MasterCard/Visa, Discover, American Express) are also accepted. To request a fee waiver, please complete a Motion and Affidavit for Leave to Appeal in Forma Pauperis (form A-18). For information on how to designate transcripts for the record on appeal, please refer to Ninth Circuit 10-3. For instructions on how to order transcripts, see Court Reporter/Recorder Transcripts. If you cannot access the Court's website in order to obtain any of the above-mentioned forms, please call 213-894-3570 and leave a detailed message including your name and mailing address. The requested forms will be mailed to you within 24 to 48 hours.